When your kids are not using the Samsung Kids service app, parents can watch a movie, go shopping, play games, listen to music, read the latest novels. With the Galaxy Tab E Lite 7.0", there are endless ways to relax, be entertained and stay informed. In addition to Samsung Kids service apps and games, parents can enjoy access to over a million apps from the Google Play™ Store. Your kids can explore a variety of engaging Samsung Kids service content that aligns with STEM and Common Core curriculum. Plus they learn by interacting with their favorite characters so they always look forward to coming back to learn more. Bring your kids the educational content you trust from Dreamworks Animation, Sesame Street, National Geographic and more. Subscribe to Samsung Kids service for $4.99/month with the Tab E Lite to access hundreds of apps that automatically adapt and grow with your kids so they’ll stay engaged at every age. Set limits. Set them free. Samsung Kids service helps you keep an eye on tablet time. Set time and select app categories for your kids and monitor their progress on the dashboard. Plus there are no ads so you can rest assured that your child is only engaging with the content you trust. Samsung Kids service also does not allow in-app purchases so you won’t be caught off guard by unauthorized purchases. Durable design. Long battery life. 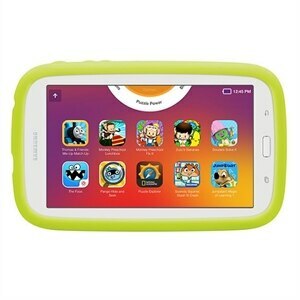 The soft, durable bumper case on the Samsung Kids Tab E Lite makes it comfortable to grip and easy to play with anywhere—even when things get rough around the edges. And with up to 8 hours of battery life* and a 1.2GHz Dual-Core processor, dependable power is always within reach. Tab E Lite is designed for ultra portability to carry with ease everywhere. Its concise slim form factor is sure to please. Enjoy the comfortable hand grip, complemented by its extreme light weight - feel the difference! 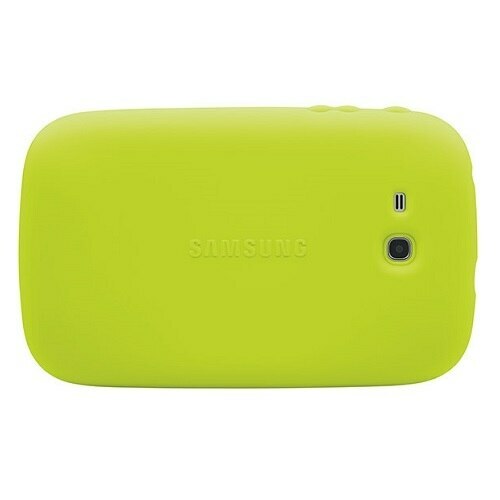 Beautifully compact with long-lasting power - what more could you ask?